This book makes Back to the Future look like child’s play. Considering the publish date of this novel, Isaac Asimov proves that he is ahead of his time even today. 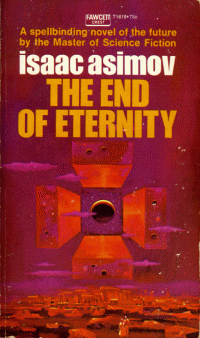 I have not really read many time-travel intesive books but Hollywood can’t compare to the master of Science Fiction. This was a rather short read for me as I had just finished the Lord of the Rings trilogy. The pace of the book is a bit slow at the beginning but picks up quickly toward the end. I enjoyed the time perspective change from the main character and found it to be rather unique. If you are an Asimov fan and haven’t read this book, you are cheating yourself out of a good read. I agree that the book was a little slow-moving at the beginning, but I appreciated that the storyline and details of the main concept of time travel were laid out so well…otherwise it would have been impossible to understand what was going on at the end. This was an excellent sci-fi read, and a little bit of a love story as well.